Joanna was born January 21, 1876, the youngest of the family of William and Mary Henry. Her father died in Perth, Ontario when she was just over 2 years old. When Joanna was 5 years old the Henry family, Widow Mary and her 11 children, left for the Manitoba where more land would be available for homesteading for her family. My great grandmother Elizabeth was the eldest in this family. They went to Brandon where the railway ended at that time and an ox cart would have been next, taking them to the home of her father's brother John and his wife Jennet who had "broken the trail" for them 3 years earlier, in the district northwest of Rivers, MB. The story goes that they lived together - 25 souls under one roof, until Mary and her family could construct their own shelter on nearby land claimed by them. The first house at SW 6-14-21 was built of logs brought from the Newdale-Sandy lake area- a distance of roughly 40 miles. A large stone house was built in 1888 which became a landmark and community meeting place for many years. Stones from that house were later used in the building of a cairn to remember the Whitebank Lea School and Pioneers. Joanna married William Braid on March 10, 1904. It is said in the 1959 Blanshard history book that this event took place during one of the worst blizzards that was ever experienced in the area. Billy, as he was known, had arrived to Oak River from Scotland in 1891 at the age of 17. He worked as a herd boy for the Miller and Short families. In 1896, he took employment with Widow Mary Henry where he remained for the next 4 years. In 1900, Billy had saved up enough money to buy his own farm, on SW 7-14-21 from the CPR. Buying a farm was only part of what he needed as oxen and a plow were needed to break the soil to prepare for seeding a crop. Four years later he was established enough to ask for the hand in marriage of his former employer Mary Henry's youngest daughter Joanna. Billy was involved in his community with the Zion Church that was just east of his farm,Whitebank Lea school board, Oak River Agricultural Society and Brandon Summer Fair Board. Aunt Dodie wrote beside his photo in one of her history books that he was one of her favorite uncles. Billy served as Reeve of the RM of Blanshard from 1922 to 1931. He succeeded his brother-in-law Ned Henry, Joanna's brother. The Blanshard History books says that this period of time was when road and bridge building was at its peak in the municipality. Poor economic conditions hit in 1930 but discussions were still held regarding supplying electricity to the villages of Oak River and Cardale. William Braid passed away on February 27, 1937 at the age of 62. The side of the gravestone for William and Joanna Braid is inscribed for an Ellen Spence. 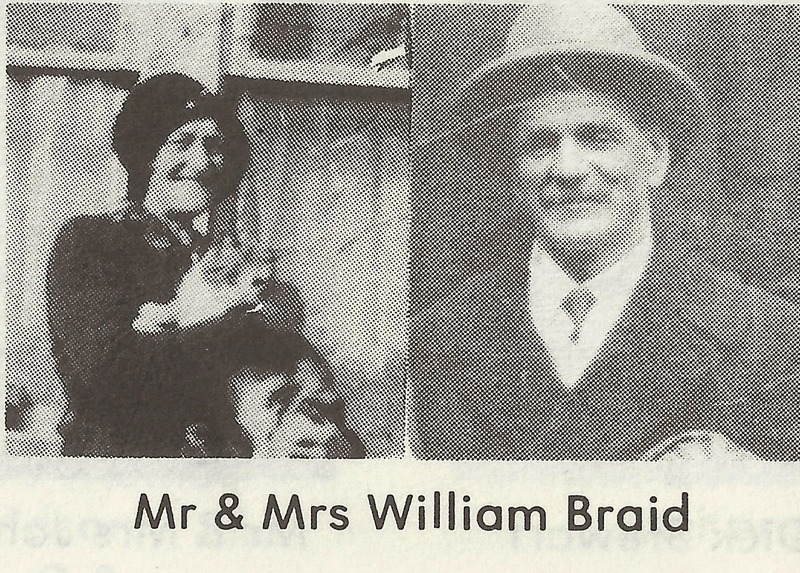 On the 1916 and 1921 Manitoba Census, she can be found living with the Braid family and is noted as William's mother. The census documents indicate that she arrived in Canada from Scotland in 1909. The inscription on the stone says she was born May 12, 1850 and died October 29, 1926. I have not found any further information about her or other Braid family. Joanna and Billy had three children but only one daughter survived infant hood, Jessie Rowena, born May 18, 1911. Jessie attended Whitebank Lea School and although she had no siblings, no doubt she had plenty of playmates with so many Henry cousins living nearby and attending school with her. She married John Wesley "Wes" Clubb of Lyleton, Manitoba in 1938 and the couple operated the Braid home farm together. In 1914, William Braid had built a large dairy barn which stayed in continuous use until 1942 when it burned to the ground. It was replaced with a more modern structure and the Clubbs moved from raising Ayrshire cattle to Herefords and then Charolais. 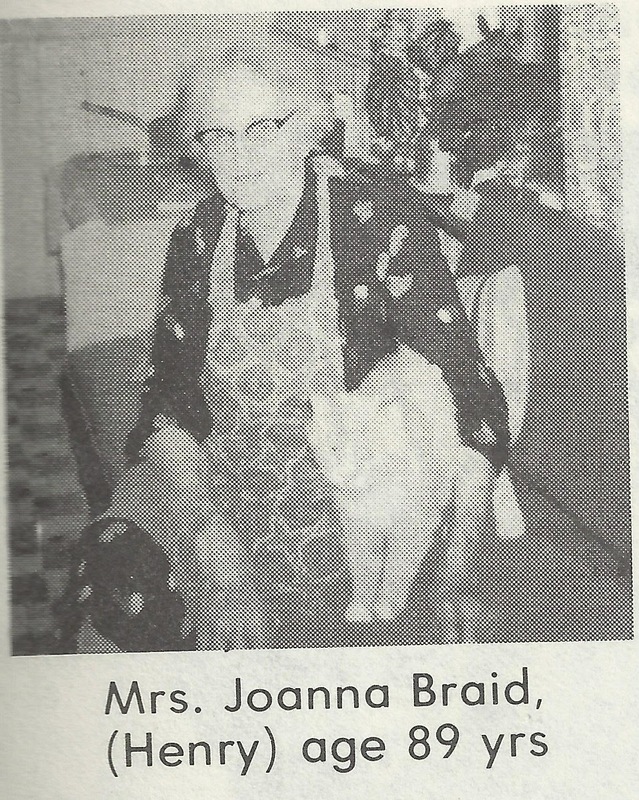 Joanna lived with her daughter and son in law on the home farm until she passed away in 1970 at the age of 94. 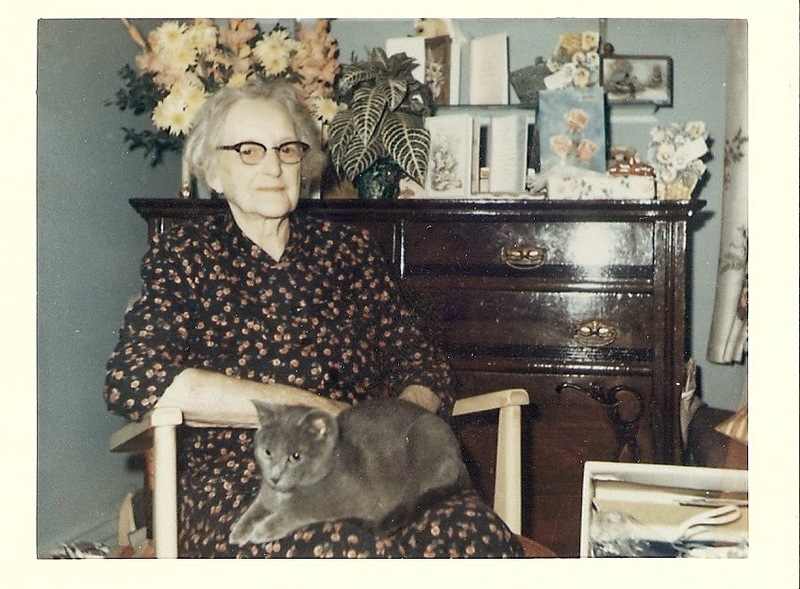 With the three pictures I have of Joanna each including a cat, I can be fairly confident that she had an affinity for cats! I remember her daughter Jessie in the 1970's visiting at Aunt Dodie and Uncle Sam's . She and Wes were staying in the yard with their camper and had two or maybe three cats tethered to leashes nearby. Jessie and Wes didn't have children but always had special pets. The is a brief outline of the thirty years Wes and I have lived on the farm and trust that in generations to come they will read about and remember "The Clubbs".